The long term effects of the self driving car movement could potentially be staggering. Price waterhouse Coopers (PwC) predicts that the number of vehicles on the road will be reduced by 99%, estimating that the fleet will fall from 245 million to just 2.4 million vehicles. Ancillary auto related industries such as the $200 billion automobile insurance market, $100 billion automotive finance market, $100 billion parking industry, and the $300 billion automotive aftermarket will collapse as demand for their services evaporates. Nextbigfuture thinks car ownership reduction will lag the actual fall in private vehicle usage. This is because the older generations will be reluctant to give up owning vehicles even if they shift to robotic ride sharing for commuting. There is still vehicle ownership for status in cities like Hong Kong and New York where there is excellent public transit and taxis. In Europe alone, the automotive (building cars) industry accounts for roughly 12 million jobs (including related jobs); in the US, more than 8 million; and in Japan, more than 5 million. The Bureau of Labor Statistics lists that 884,000 people are employed in motor vehicles and parts manufacturing, and an additional 3.02 million in the dealer and maintenance network. Truck, bus, delivery, and taxi drivers account for nearly 6 million professional driving jobs. Virtually all of these 10 million jobs will be eliminated within 10-15 years. Globally there are 50 to 100 million driving jobs. -reduce the number of cars by 90%. About 5.5 million motor vehicle accidents occurred in 2009 in the U.S., involving 9.5 million vehicles. These accidents killed 33,808 people and injured more than 2.2 million others, 240,000 of whom had to be hospitalized. Adding up all costs related to accidents—including medical costs, property damage, loss of productivity, legal costs, travel delays and pain and lost quality of life—the American Automobile Association studied crash data in the 99 largest U.S. urban areas and estimated the total costs to be $299.5 billion. Traffic congestion wasted 4.8 billion hours and 1.9 billion gallons of fuel a year for urban Americans. That translates to $101 billion in lost productivity and added fuel costs. A senior who cannot drive might easily pay $4000 per year for transportation. This is usually on a fixed income. 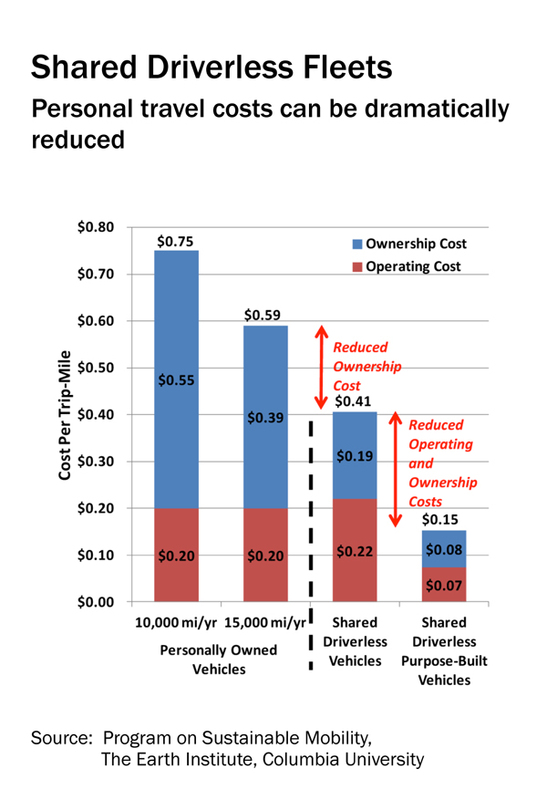 Lowering the costs by five times would be $800 per year for transportation. Young people (under 16) who cannot drive would have mobility options other than being driven by their parents. Society will have a lot more net benefits from robotic cars.